Sydney Shop Girl: Homeward Bound Just Before Christmas. It's a Snoop Dogg kind of day. If 'Drop It Like It's Hot' is not your favourite (or close to favourite) song from the Doggfather then there's no real need for you to click on the clip. In honour of Snoop, I went for wild colour and animal print today. 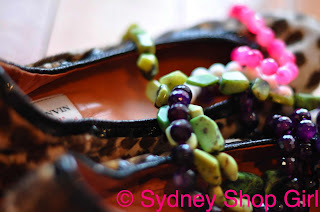 Flats - Lanvin, necklaces - Fuchsia City and Jade City by Red Phoenix Emporium. I left the dreadlocks, gold chains and jaunty head gear to the professionals. I know my limits. The holidays are finally here. It's pretty tragic to admit this, but I'm amongst friendly readers (and we've started tonight with Snoop Dogg) but I've been barely hanging on at work for the last week or so. These last few days have positively dragged. All the shopping and baking and gifting at the Sydney end of things has happened and now it's finally time to sit back and relax for a few days. I'm really looking forward to seeing my family, friends and heck even the family house. Chats with mum, keeping dad company in the earlier hours of the morning (mum is not a morning person) and going for a run down those same streets I paced in those angst ridden teenage and early adult years. Being home is a state of mind that I've somehow managed to achieve in both Perth and Sydney. It's just time for me to recharge and reconnect with my Perth life. There was another reason I had the lyrics of Snoop in my head. I was communicating by email with my brother H this morning. Despite living in Oxford for the last 3 years and spending his formative years in Australia, H's grammar and spelling are decidedly gangsta. There are no capitals, lots of apostrophes within prepositions and missing letters in participles and gerunds. H was replying my emails appropriately but all I could see was Snoop Dogg lyrics. Hence the clip at the beginning of tonight's post. We were trying to lock down plans for when H arrives in Sydney. We sent about 12 emails between us and then his final one totally confused me. I couldn't figure out whether we were or were not going to Newcastle together on a zany brother and sister road trip. I was saved by the thoughtful attachment H sent from his new employer. In more mundane matters (so mundane there is neither a youTube clip or photo for these paragraphs), I am packed for Perth. I'm under 23 kg, most of it is gifts and I've got my hand luggage sorted (2 tins each of Rum Balls and Melting Moment biscuits). My clothing options range from 'animal' (so categorized for the fauna embroidered on the shirts) to 'beach' (bathers, maxi dresses and white straw hat). They will be anchored by a pair of white birkis. I'm all set. I don't know whether I'll be able to blog from Perth. This could be it for a while (though I hope not). If I'm not around again soon, I'd like to take the chance in this post to wish you all a Very Merry Christmas and a Safe and Prosperous New Year. I hope you have a lovely break with family and loved ones, to take time and reflect, to just relax. Have a lovely Christmas with your family in Perth and go easy on the $20-Cottesloe-Coffees! I really loved reading your blog this year. I get excited each time I see you have written a new entry! Looking forward to hearing about your time away! Warmest wishes to you, SSG, for a funny,happy,hugs and kisses, rumball filled Christmas! May all your wishes come true, and the new year be filled with contentment. Thank you for writing your lovely blog - a present for us which goes all year. Happy Happy Christmas and a safe trip. enjoy your holidays and Perth and your family! I wish you a Merry Christmas and a Happy New Year! Oh, thank you so much for all our kind comments and good wishes. I've had great fun writing SSG and your comments have cheered and inspired me. Thank you for your thoroughly entertaining posts this year! Many more thanks for supporting Willow and I as emerging designers - it means so much to us! Have a wonderful festive break in Perth (I am going to Darwin for the first time this year!) and look forward to keeping in touch in the new year. Merry Christmas SSG! Have wonderful holidays at home. And, do you know, I believe Lanvin is the only brand that I crave at this moment, no matter what they make. Hahaha on reading about your brother's gangsta penmanship! And what a funny reference to Snoop Dog.